In recent years Tom Cruise has really become more synonymous with crazy than acting. Which is not fair to him as an actor as the two rarely have anything to do with each other. If they did, I doubt there would be any good actors. Which is not to say that I'm a Tom cruise fan myself. I enjoy him in movies, but I never go out of my way to see a film he's in. But that's why we do it this way; to eliminate bias. Most of the time Tom Cruise chooses his movies carefully. He's not the type who does five films each year. He's always been pretty selective. While there are a few bad apples in the mix, there's nowhere near enough to damage what is a pretty amazing overall career. 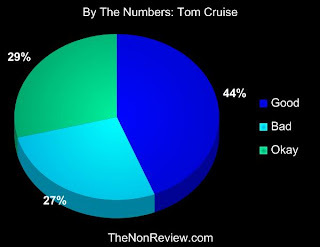 It can be difficult at times to separate the person from the actor, but that's what this system does, and whether or not you like him personally, when the numbers are crunched, at 73% positive over 27% negative, Tom Cruise is a great actor. Course, if he keeps on making Mission Impossible sequels the numbers could always start to slide. I can't remember if anyone suggested him, so I'm sorry if I haven't properly credited you. Who should I do next? Please let me know in the comments. I wonder what would happen if you looked at 2005-Present seperately. I vote Natalie Portman for next. Rachel McAdams for the elite! NO NO NO...Cruise is not a good actor. He can only play Tom Cruise regardless of what your numbers say. I have yet to be fooled that this little midget is a super agent, or a Japanese samurai or a one eyed Nazi. I am adding everybody's suggestions to the new list. Suciô, I've been tired of Robin Williams shtick for several years, but despite that I can think of at least a dozen good movies he's done off the top of my head. Though I still wish he'd stop and go away now. Kal, Most actors, lead or otherwise, are still essentially character actors who play different variations of the same role. Cruise is no different. This was a begrudging thing for me as I went through his credits and had to admit, not just how many good movies he's been in, but how many I've actually enjoyed his performances in as well. I like Tom Cruise despite the reputation he has earned over the years. I still think he has more charisma than most male leads and I think he's a good actor. This one you totally nailed. He is very choosy as opposed to a Samuel L. Hmmm next actor I think you should do is Harrison Ford. Tom, I did Buscemi a few months back. He should be listed in the BTN page. Copy, Actually Harrison Ford is the first one I did, but that was before I really tweaked and got the system to as close to perfect as it is. So in all fairness I should redo him. Hmmmm.....thinking, thinking. How about Liam Neeson. Have you done him already? Would you do Christina Ricci...I mean of course you would, I meant could you do Christina Ricci...of course you could, just do her already. This review seems very fair, and you picked a good photo. I think he's better looking than he is talented, but I've only seen him in one or two movies. Yeah I realized after I read your facebook response that I was thinking mostly of tabloid tom cruise. I do enjoy quite a few of his movies. I'm thinking you did John Cusack? Steve Martin? That is really interesting! I love that pie graph. I want to eat it. With whipped cream. And chocolate drizzled on it...with a cherry. Found you via Copyboy's site b/c you are "blog of the day". Are you wishing you weren't? I might not have found you then. :) But, now...I'm following you! Mwuhahahaha!!! While this certainly seemed a little random; it is none-the-less accurate and you make a fine point. i vote for johnny depp too. ..or gary oldman, or crispin glover, or cillian murphy, or parker posey or alan rickman... yeah. I used to dislike Tom because he was such a poor actor, but to my surprise he got better, and dare I say, good. Now I know your scale is more about movie choices, than acting ability, but I still totally agree with you. Therefore you're right! I don't like Tom Cruse as a person or as an actor, but he is very picky and usually selects movies that are going to be good, whether or not he is in them. He was guilty of one of the worst acting jobs I've ever seen. It was in "born on the fourth of july." I thought he was TERRIBLE in that movie. I was surprised at first, but looking back at his work, I guess he really does have a pretty good track record regardless of how batshit crazy he is! Cruise is fine playing Cruise, but little else! He was popular on screen so he got offered the best scripts. Talent wise not so hot!